Foe, 69, was one of the first persons in the state to undergo irreversible electroporation, better known as the NanoKnife®. Swedish Medical Center recently became the first hospital in Colorado to offer the procedure, which, according to Foe’s follow-up CT scan, appears to have done its job. And compared to more traditional chemotherapy and radiation, which Foe has had his share of, the NanoKnife® was "pretty much a walk in the park," the retired Highlands Ranch resident says. Foe's procedure, performed by Charles Nutting, DO, FSIR, an interventional radiologist with Swedish and Sky Ridge medical centers, involves placing probes, similar in size to IV needles, strategically around a tumor site. Generally, two to four probes are inserted, using an ultrasound or – as in Foe's case – a CT scan to accurately measure and guide the probes. Patients must be completely still for the procedure and so are placed under general anesthesia. Once the probes are set, a current is sent that travels between the probes, opening up the pores in the tumor, which eventually kills the cells. "The reason we chose this procedure for Mr. Foe was that his tumor was close to the diaphragm and other critical structures," Dr. Nutting says. "The unique thing about this therapy is that it spares normal tissue, so we can use this deep inside of the liver or in other areas that are adjacent to critical structures with less chance of damaging healthy issue and blood vessels." Not everyone is a candidate for NanoKnife®. 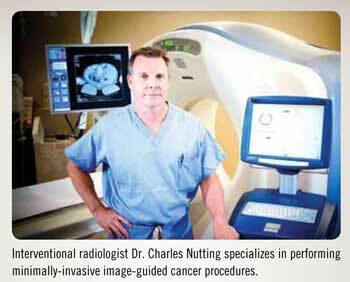 "We generally want tumors less than 5 centimeters in size and fewer than three in number," Dr. Nutting says. The technology is still in its infancy, but is approved for soft-tissue ablation. It's also been used in the pancreas, prostate, kidney and liver, Dr. Nutting's chief area of expertise. The procedure takes less than an hour, and patients are generally kept one night for observation. "I didn't experience any discomfort," Foe says. "I spent the night in the hospital, but nothing ever hurt. My wife looked, and you really could hardly see a thing, maybe a little pin-mark." Foe says medical technology continues to amaze him. "Yeah, they’ve come an awful long way. I imagine 10 years ago, I wouldn't be alive with pancreatic cancer. Plus, my wife keeps saying there's something abnormal about me. I've gone through this whole thing with pretty much a positive attitude. I think that's part of beating anything. You have to maintain your attitude." Who's at Risk for Pancreatic Cancer?